In the female dog, cells of the uterus can accumulate lipid droplets to form so-called foamy epithelial cells during late metoestrus. These cells produce a hormone that is involved in the implantation of the embryo in the uterus. A team of researchers from the Institute of Anatomy, Histology and Embryology at Vetmeduni Vienna has now shown for the first time that the factor assisting the cells in lipid accumulation also facilitates the binding of bacteria to the epithelial cells, resulting in serious infections of the uterus in female dogs. Two studies on this subject were published in the journals Anatomia, Histologia, Embryologia and Theriogenology. The epithelial cells form the inner protective layer of the uterine membrane and are responsible for the processes of reception and transduction in cell signalling. This important layer of cells changes in dogs in course of the oestrous cycle. During the receptive phase, the epithelial cells start to accumulate fatty substances known as lipids. These lipid accumulations give the cells a foamy appearance, which is why they are then called foamy epithelial cells. 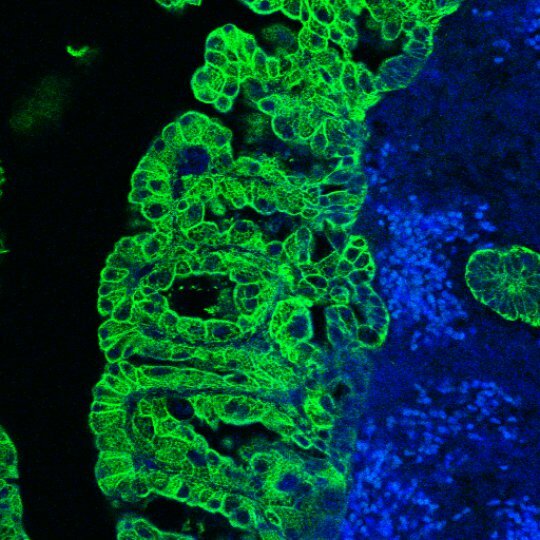 In humans and other mammals, foamy epithelial cells indicate a pathological change. In dogs, however, they have an important role. “The foamy epithelial cells, like other lipid-accumulating cells, produce a hormone-like protein called leptin,” explains study director Cordula Gabriel from the Institute for Anatomy, Histology and Embryology at the Vetmeduni Vienna. “Leptin has a role in the implantation of the embryo and the formation of a functional placenta.” The lipid accumulations could also have a role in nourishing the embryo. The formation of foamy epithelial cells thus appears to be of importance for a successful pregnancy in dogs. The changes also appear to be associated with the common phenomena of pseudopregnancy among non-pregnant dogs. In their study, Gabriel and her team discovered another possible mechanism to explain how the epithelial cells accumulate lipids. The cells contain a specialised lipid receptor, known as Scavenger Receptor B1, in their membrane. Scavenger receptors bind lipid-like compounds from the blood, which can then be absorbed by the cell. The receptor performs this exact same function in the cells of the liver. The researchers for the first time succeeded in demonstrating the presence of these signal transducers in foamy epithelial cells. Gabriel also describes how pathogens, such as bacteria, can use this receptor and cause a serious inflammation of the uterus. She suspects that pyometra, a potentially fatal purulent inflammation of the uterus, is caused by bacteria that bind to the receptor on the foamy epithelial cells. Pyometra often occurs in exactly the same phase of the oestrous cycle in which the foamy epithelial cells are present. The foamy epithelial cells are present in the uterus until the late phase of the oestrous cycle. This results in a long period (over 60 days) in which the bacteria can bind to the receptor and infect the tissue. Gabriel was able to show that cells of inflamed tissue produced scavenger receptors more frequently than healthy cells. “The binding of foamy epithelial cells is helpful for a possible pregnancy. At the same time, however, the surface of the membrane becomes more susceptible to pathogens,” says Gabriel. Epithelial cells have a very special structure. They are polar, i.e. they have two poles and a sort of top and bottom. The outward-facing side is called apical, the inward-facing side basal. For the accumulation of lipids, it would only be necessary to have the receptor on the basal side of the cell. But it is also present on the upper side. If the presence of the receptor would be restricted to the basal membrane of the epithelial cells, bacteria would have a lower chance of binding with the cells. The function of the apical signal transducer remains unclear. One possibility is that it has a role in the secretion of the accumulated lipids in order to nourish the embryo in case of pregnancy. But they could also serve as signal receptors in the uterine surface for the implanting embryo. Web Source: Veterinärmedizinische Universität Wien.